A Chinese manufacturer reconstructed for four fans and four pumps of two sets of 300MW generator in 2003. The company purchased Gozuk frequency inverter for motor of 5# condensing pump in May 2003. After successful application of 5# system, the company purchased another manufacnter's frequency inverter for two PA fans. After one year operation, the company found frequency inverter could save much energy and bring enormous benefits. Because two kinds of frequency inverter drive different loads, it is not so easy to compare exactly. In order to promote frequency inverter application in power plant, we think it is necessary to make comparison, hope this paper can make reference for other power plants. In normal operation, K40 and K410 close, QF1 opens. 1# pump runs in variable frequency. K420 and QF2 open. Pump linkage plunges. 2# pump is standby in direct on line. When variable frequency pump is broken, the standby pump linkage starts to work. In order to avoid damage on frequency inverter, DCS has logic lock. That is, only when K410 or K420 closes, can K40 close. Two pumps share one frequency inverter, which can utilize frequency inverter farthest, and also save reconstruction cost. But in this way, periodical switch is complex. When variable pump trips off and standby pump starts, impact on pipeline is big. 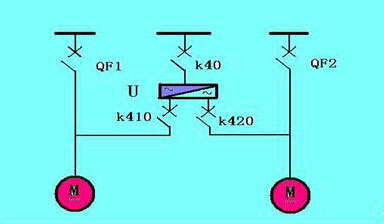 When PA fan runs in variable frequency, QF closes, K421 and K422 close, K423 opens. 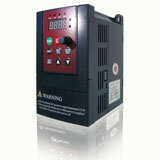 When frequency inverter is broken, motor is switched to direct on line manually. 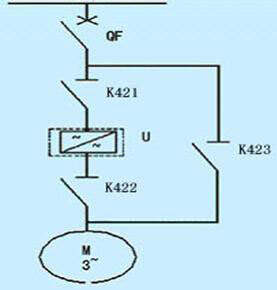 In order to avoid mistake, K422 and K423 are interlocked mechanically. That is, K422 and K423 can not close simultaneously. “One drive one” is the most basical mode. Cost of this mode is higher than “one drive two”. Gozuk frequency inverter and the other manufacturer's frequency inverter are medium-medium voltage source frequency inverter. Frequency inverter input adopts multi-pulse rectifier without filter. Output waveform is near to sine waveform and little affection on power grid. Two kinds of frequency inverter adopt speed sensorless vector control, can meet load requirement of high dynamic response. Power cell is designed in module. Power cell can be replaced easily and replacement time is short. In rated load, efficiencies of frequency inverters are more than 96%. After reconstruction, cost of power generating lowered a lot. Especially for the condenser pump, no matter in rated load or in part load, energy saving is obvious. Following table is comparison data. From above statistic data, we see energy saving is obvious with load down. In load 150MW, pump system saves energy 77.6%, two PA fans save energy 63.6%. In rated load, pump system saves energy 33.5%, two PA fans save energy 20.4%. Power price: 0.3yuan/kWh, cost saved of pump is 937000yuan(USD137794) every year. Cost saved of two PA fans is 779000yuan(USD114558) every year. After successful application of frequency inverter on 5# system in May 2003, the company made same reconstruction for 4# system. From above statistic, we see six frequency inverters occur unplanned outage 8 times. 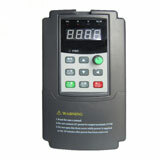 frequency inverter of 5# pump stops 3 times. frequency inverter of No 41 PA fan stops 3 times. frequency inverter of PA fan of No 42 stops once and No 52 once. Available factor of all frequency inverters are more than 90%. Available factor of 4# pump frequency inverter and No 51 frequency inverter can reach to 100%. Minimum available factor of No 41 frequency inverter is 90.3%. Max continuous operation time of No 41 frequency inverter is 6381.5h. Max continuous operation time of No 51 frequency inverter is 9150.3h. Because 4# system had maintenance of 11 days in early October, its operation indexes are less than 5# system. From the application, no matter Gozuk frequency inverter or others, the applications are very successful. Comparatively speaking. Low price and all-round service are important factors which absorb power plant.